This post is about integrating Glimpse in ASP.NET Core application. Glimpse is a web debugging and diagnostics tool used to gain a better understanding of whats happening inside of your ASP.NET application. First you need to add reference of Glimpse in the project.json file. And you need to configure the startup.cs file to add and use Glimpse. You need to add import Glimpse in the namespaces. Now Glimpse is configured. 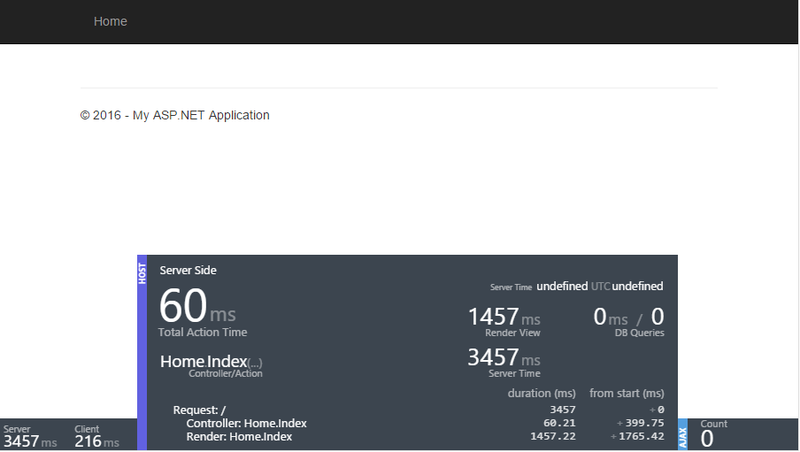 Now you can run the application with dnx web command. You can browse the page and Glimpse dashboard at the bottom of the screen like this. And you can click on the right side and get more details like this. Since this is the hello mvc application, it doesn’t have data access and ajax calls.